Pointy, pointy scissors - ZineWiki - the history and culture of zines, independent media and the small press. Pointy, pointy scissors (200?) is a comic zine by Australian zinester, writer, graf artist and designer Guy Sterling. It was published as an A6 + A7, black and white, photocopied zine. To this basic format, Sterling has then added red spray paint as a visual and thematic enhancement. 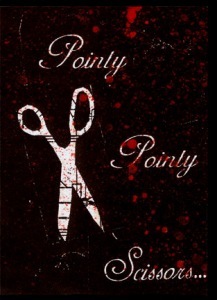 Pointy, pointy scissors is a one shot zine. This page was last modified on 18 January 2008, at 13:00.